Craving for Filipino food in Egypt? 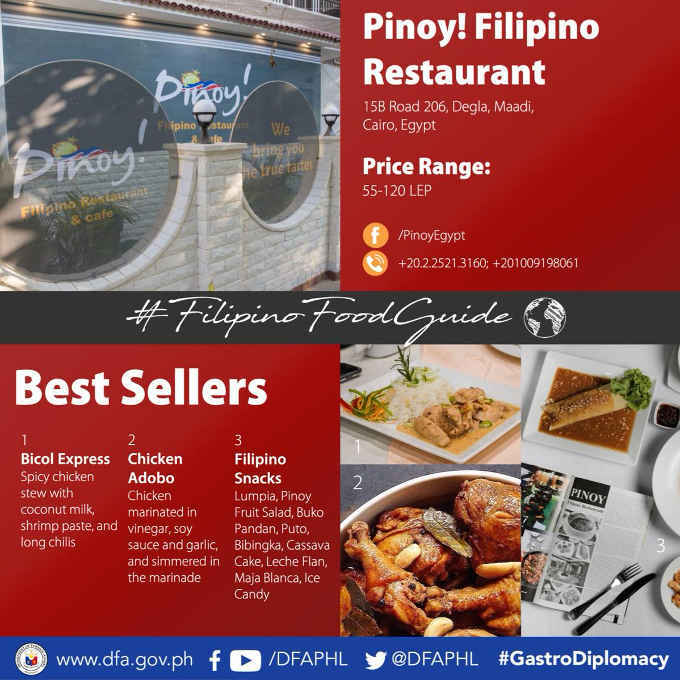 Try Chicken Bicol Express, Chicken Adobo, and sweet and savory Filipino snacks at Filipino Restaurant in Cairo. The Filipino Restaurant in Egypt is located at 15B Road 206, Degla, Maadi, Cairo, Egypt. The price range of the Filipino foods is between 55 to 120. If you crave for Filipino foods, you may inquire at +20225213160 and +201009198061. The Best Sellers are Bicol Express and Chicken Adobo. The Bicol Express’ ingredients are spicy chicken stew with coconut oil, shrimp paste, and long chilis. The Chicken adobos’ ingredients are chicken marinated in vinegar, soy sauce and garlic and simmered in marinade. Filipino snacks are also available. Filipino snacks available are Lumpia, Pinoy Fruit salad, Buko Pandan, Puto, Bibingka, Cassava Cake, leche Flan, Maja Blanca, and Ice Candy.